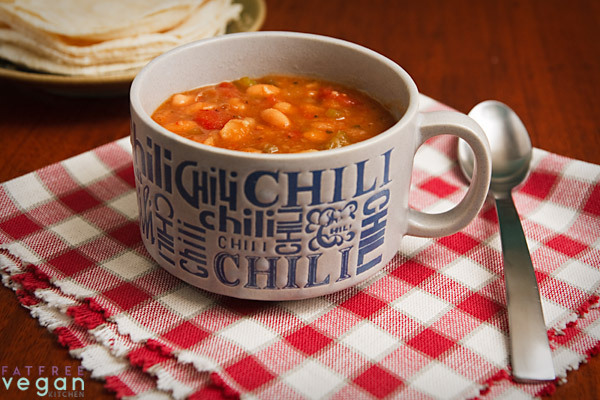 I’ve been playing around with this chili recipe for a couple of weeks now, trying it in two old-fashioned appliances that are becoming popular all over again, the crockpot and the pressure cooker. My crockpot had been sitting unused on my shelf for at least a year, so I decided to give it one more try… and that’s when I remembered why I’d much rather use a pressure cooker than a slow cooker. Certainly there are some dishes that taste better with long, slow cooking, but most of the time I find that drawing out the time it takes to cook something doesn’t improve the flavor and actually hurts in recipes where ingredients should be added at different stages of the cooking process. Plus, I’m never completely sure when the beans that I start in the crockpot in the morning will be done. Every time I’ve used my crockpot, I’ve wound up adding more time or increasing the heat in an effort to make sure my beans are well-cooked. The pressure cooker (or lately, Instant Pot), on the other hand, cooks time-consuming foods like dried beans so quickly that there’s time to spare for adding ingredients in stages and allowing them to blend together. And if more cooking is needed to soften up tough beans, it’s as easy as replacing the lid and bringing the cooker back up to pressure for a minute. But I know there are people who love their slow cookers, so I’ve included crockpot instructions just for you–as well as stove top directions for those of you who use neither appliance. 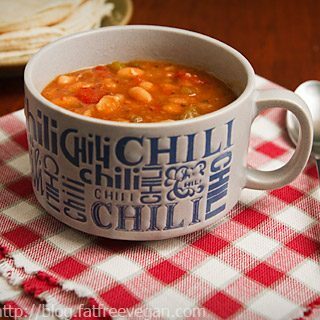 However you cook it, this vegan white bean chili is truly delicious, if I do say so. Mildly seasoned (unless you opt to add more pepper), its flavor is made richer and deeper by caramelized onions, while masa harina added near the end thickens it and adds mellowness. Read the recipe carefully to learn my amazing, patented (not really) secret for speeding up the browning of onions. You can find all of my pressure cooker recipes here. Mildly seasoned (unless you opt to add more pepper), its flavor is made richer and deeper by caramelized onions, while masa harina added near the end thickens it and adds mellowness. Heat a non-stick skillet. Once it's hot, add the chopped onion. Cook, stirring and scraping the bottom of the skillet, until onion is golden brown, adding a tablespoon of water if necessary to keep it from sticking. (Tip: Add a couple of pinches of baking soda to speed up the caramelization.) Add the onion to the beans. Seal the cooker and bring to high pressure. Reduce heat and cook for 10 minutes at high pressure. (On IP, set pressure cooking time to 10 minutes.) When the 10 minutes are up, remove from heat (or turn IP off) and allow pressure to come down naturally. Check to make sure beans are soft, and if they aren't, return to high pressure for another minute. Once the beans are soft, add the salt and tomatoes and taste for seasoning. If necessary, add more cumin, pepper, and chili powder. Simmer over low heat for at least 20 minutes (use Saute set to low on IP). Just before serving, add masa harina; stir well and simmer for at least 5 minutes to thicken. Cook until beans are completely soft, on high for at least 6 hours or on low for at least 8 hours (crockpots vary, so adjust times as necessary). Add the salt and tomatoes, check seasonings, and cook for at least another hour. Add the masa and cook another 10 minutes. Cover and cook on low heat until beans are completely tender, about 1 1/2 hours, adding water as necessary. Add the salt and tomatoes, check the seasonings, and cook for at least 20 minutes. Just before serving, add masa harina, if necessary to thicken; stir well and simmer for at least 5 minutes. To quick-soak beans in the pressure cooker, cover with two inches of water and bring to high pressure. Cook at high pressure for 1 minute, remove from heat, and allow pressure to come down naturally before draining and using beans. To quick-soak without a pressure cooker, cover beans with 2 inches of water and bring to a boil. Boil for one minute. Cover and let stand for 1 hour before draining and using beans. This is a zero-points recipe on Weight Watchers Freestyle if you use a fat-free vegetable broth or water. I just made the chili and I as worried that it would be to full of veggies for my ultra picky fam. but I think this is going to be a big hit! I’m serving it with some cornbread. Yum! Thanks for sharing!! I just made your white bean chile. I used ground up taco shells for the masa harina. It was delicious with cilantro for garnish. What an interesting idea to grind up the taco shells! Glad you liked it. 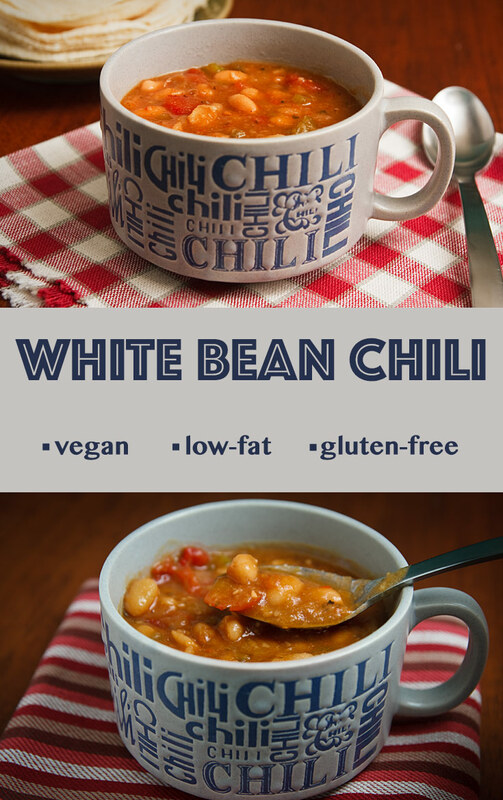 I am going to try your White Bean Chili for fathers day. I have some corn dumpling mix that I made a couple days ago that I need to use up. I will boil those in vegetable broth small amounts and serve on top of the chili. I’ll let you know how it turns out. I made this last night and it was delicious. 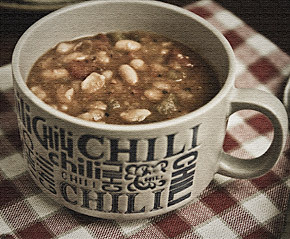 Its the perfect bowl of comfort on a cold snowy day. Thanks for the great recipies. I have been folowwing for years and I am always pleased the the results. I have not made anything yet that I have not loved and remade time and time again. I love the cup. Where did you get it from? I got lucky and found the cup in a thrift store. I have a question about pressure cookers. I’m anxious to jump on the bandwagon, and wondered if you have a favorite? Do you have an Insta-Pot, or have you tried one? I seem to see that talked about a lot in the plant based communities. I bought mine before the Instant Pot came along. It’s a Fagor Multicooker, I’ve had it for several years, and I love it! I’ve owned at least 6 pressure cookers, and it’s my favorite (I never use the very expensive Kuhn Rikon cooker that I still have). A lot of people are now buying the Instant Pot because it has a stainless steel pot, but I like the non-stick coating on the Fagor. If you’re using canned beans, how many cans? I would guess 3-4 cans, but you won’t need as much vegetable broth. If I soak the beans over night do they still need 6 hours on high? They may not take that long to cook, depending on how old they are, but it’s wise to allow that much time just in case. I have made this chile in the past and it was delicious. Will make it again soon! This recipe is delicious! I love the flavors and the texture. It’s very filling and satisfying. It’s going in our family recipe file! I made this using one can each of navy, cannellini and northern beans I had in the cupboard. The addition of fire roasted tomatoes is wonderful, and I was happy to be able to use up some of the huge bag of masa in my freezer 🙂 I never thought to use it as a thickener in soups. It adds a very nice, slightly sweet touch. Thank you for all the recipes! Could this be done using only the instantpot and without dirtying another pot for the beans? If so, how would you suggest altering your directions? Thanks! Just reverse steps 1 and 2 and do the onion in the Instant Pot instead of a skillet.